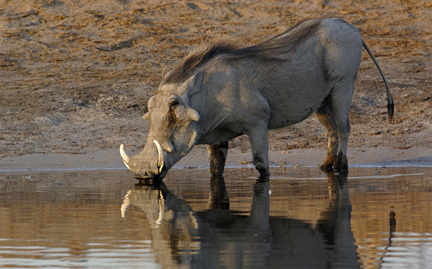 Warthogs are African pigs named for the wart-like appearance of their faces. They are confined to moist and dry African savanna grasslands, open bushlands and woodlands within range of surface water. Warthogs eat grasses and plants and also use their snouts to dig for roots or bulbs.